In the world of fashion and art, there is no room for love and affairs, which at times seem nothing but a waste of time. Art cannot be manipulated, touched or compromised. That is the way of the Woodcock house until the moment when an uncontrolled, strong-willed woman enters the house, like the deadliest hurricane, to ruin the well-structured life of someone, who has been living in an escape his whole life. Someone, who seems tries to avoid the perfection of nature, that becomes too blank and color-blinded towards the beauty that can be seen by eyes and felt deep inside of a very gentle heart. Set in the glamorous 1950’s in post-war London, the famous dressmaker Reynolds Woodcock (Daniel Day-Lewis) and his sister Cyril (Leslie Manville) are enjoying their well-deserved status in the British fashion world. They have the privilege to make dresses for the royalty, movie stars and other dames of the high class. Their life is too perfect to be shattered by any foreign cause. Reynolds is a bachelor, who, although surrounded by the most attractive women in the kingdom, has not found a perfect fit for himself. That is, until one day he goes for a lunch at Victoria Hotel. There he meets a woman who instantly becomes the object of admiration in his eyes – his muse and the source of endless creativeness and beauty. It seems that this spot could only be fulfilled by someone who is equally strong and demanding, and at times, rough – a young woman named Alma (Vicky Krieps). We come to know Reynolds as someone who has never wanted to see a woman beside him in a long-lasting relationship. Alma never really liked herself. She thinks of herself as an unattractive woman with a body shape and forms far from being perfect. While her statement has a solid ground to be proven right, in Reynolds’ eyes she is the right model for him to create dresses for. The professional relationship slowly turns into an intimate one, where both of them start developing an unlikely bond toward each other. Reynolds’ character is very interesting and richly written. As you watch and get to know him, it’s obvious that he is a person who can grasp the taste of the food before it ends up in his mouth though its smell and ingredients. Alma is a completely different character. And yet, her character starts to change when she falls for him. She demands more attention and even becomes brave enough to distract him from the love of his life – the dressmaking. As this continues, the relationship turns into a disaster. At some point, you might worry one of them is going to kill the other. While I must admit, I might seem to overreact towards a very subtle love affair, I can’t describe it otherwise. 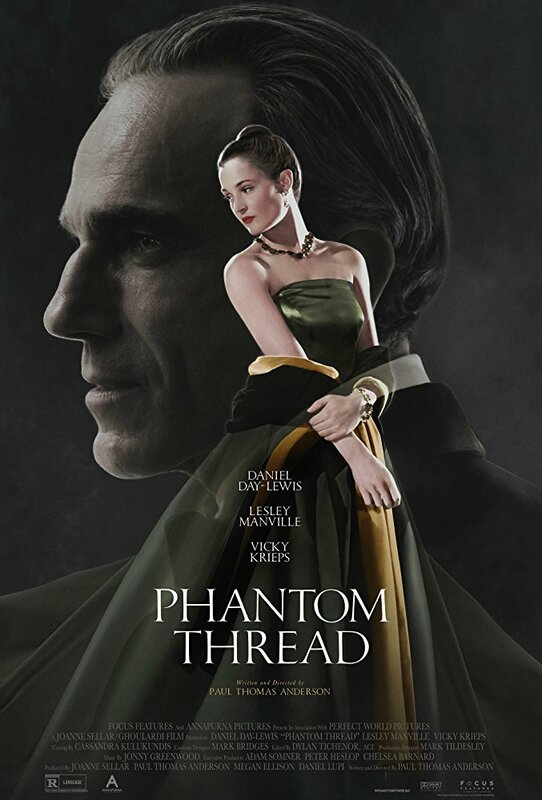 In conclusion, written and directed by Paul Thomas Anderson, “Phantom Threads” tells an extremely charming and damaging story in a cleverly way. The director explores the journey of an artist and what could make him settle down. Reynolds and Alma know no boundaries in their relationship, yet they still leave a room for a safe return to continue enjoying the madness they call a passionate and soulful love. I must mention what a delightful journey it is to watch Daniel Day-Lewis’ masterful performance along with Lesley Manville and Vicky Krieps! Well, I could write a whole separate piece on that, but I’m sure it’s much better to find a nearby silver screen and watch this film to witness all through your own eyes.